Of course, with an oscilloscope, we can measure Vpeak-to-peak directly. I have a decent Digital Volt Meter (DVM) that can measure "true RMS" AC-voltage. Like most DVMs, it only does so up to a certain frequency, well below RF. 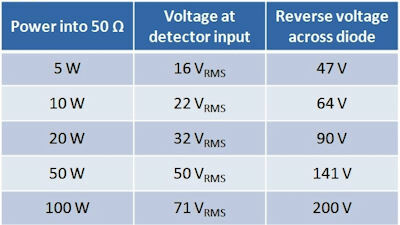 For my DVM, the specified limit is 50 kHz for the lower voltage range settings, and only 1 kHz for the 200-750 volt range. So, if we want to use a DVM, we need an RF-probe that "demodulates" the RF voltage to a Vpeak value. In its simplest form, such a probe consists of a half-wave diode rectifier and capacitor filter/smoothing. The output voltage is measured with a DC-volt meter with a high input impedance, e.g., a DVM. Obviously, this circuit will be fooled by a DC-offset on the RF signal. We can fix this by swapping the diode and the capacitor. Note that this is not necessary if you measure an RF voltage via a transformer, such as a directional coupler. We can also make life a little easier by including a voltage divider with a scaling factor that is equal to the reciprocal of √2. Then the output voltage will be the RMS value that we are interested in. We can make a voltage divider where one resistor is the input impedance of the DVM. My DVM has a published input resistance of 10 MΩ. The second resistor should be 4M14 Ω,since 10 / (10+4.14) = 1 / √2). So 3M9 + 220k = 4M12 would be a good choice. This approach is shown below. Note that the resistor should be non-inductive (e.g., bulk-metal-foil or carbon). WHAT TYPE OF DIODE TO USE? If we want to measure higher power levels with this detector, we have to use a power divider, directional coupler, or measure across a small sampling resistor that is placed in series with the 50 ohm load. low "forward voltage" (Vf, voltage drop), as the "knee" voltage of the diode determines the lowest RF-power that can be measured (relatively) accurately. 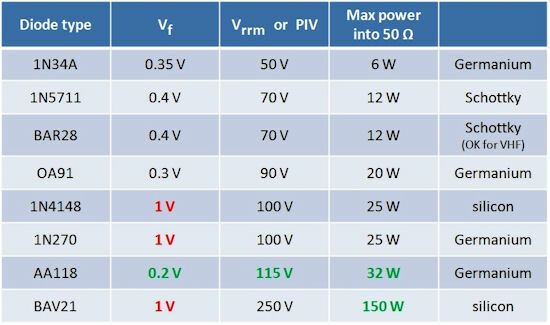 high "max (repetitive) reverse voltage" (Vrrm) or "peak inverse voltage" (PIV), as this determines the max power level that can be measured with the RF-probe, without destroying the diode. 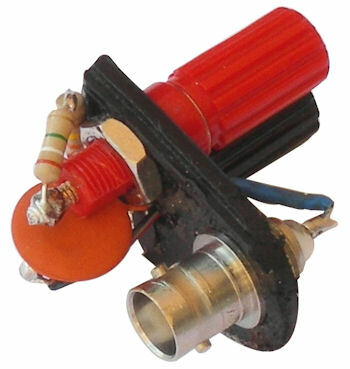 Note that these diodes are available from several manufacturers and the Vf and Vrrm may vary slightly between them. I opted for an OA91 diode, as I had one in my junk box. Note that this limits the measured power to 20 W. The AA118 (or its substitutes AA113 and 1N60) is good through 32 Watt into 50 ohm. For further considerations, see ref. 2 and 8. The concept of this probe can be expanded with a micro-ammeter instrument to make an RF current meter or a field-strength meter "sniffer".